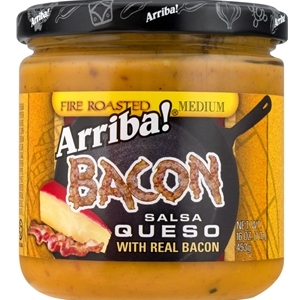 If you like queso and you like Bacon, then Arriba Bacon Queso is perfect for you! This delicious queso has a subtle bacon flavor that compliments the tomatoes and peppers perfectly. 16 Ounce. Water, cheese blend (dehydrated cheese (cheddar, blue (mild, cheese culture, salt, enzymes). whey, soybean oil, maltodextrin, salt, sodium phosphate, citric acid, lactic acid), whey, modified food starch, maltodextrin, dextrose, salt, xanthum gum, hydrolyzed yeast, annato extract), tomato, Arriba red salsa (tomato, jalapeno, cilantro, onion, garlic, vinegar, carrot, salt, sesame oil), soybean oil, jalapeno natural flavor, (water, hydrolyzed yeast, natural flavor, lactic acid), bell pepper, onion and spices. I love this salsa! I use it primarily on egg dishes as an omelet topping or on poached eggs. Great flavor for just a few calories!